A burette is a laboratory equipment commonly used to carry out a titration. A titration is a technique where a solution of a known concentration (titrant) is used to determine the unknown concentration of a second solution (analyte). A visual indicator usually signals the completion or the end-point of the experiment. Two types of burettes that are commonly available and widely used include glass burettes and digital burettes. Before we discuss how e-burettes or electronic burettes are better than both of these, let’s have a look at all three, one by one. What is a Glass Burette? A glass burette is a relatively low-cost equipment often used in the laboratories of schools and universities. It is used to carry out titrations for delivering measured volumes of a solution of known concentration. It is typically available in the form of a long, graduated glass tube with a tap and a stopcock at its lower end, and a tapered capillary tube at the stopcock’s outlet. The stopcock valve controls the flow from the tube to the tip of the burette. The difference in the initial volume and the final volume of the solution in the burette reflects the amount of the solution consumed. What is a Digital Burette? A digital burette is a relatively high-cost equipment with more sophisticated features than that of a glass burette. It can be connected to a computer and its titration readings can be saved on the same. In digital burettes, a high precision piston is used to deliver aliquots. They have a glass barrel and their piston is either glass or PTFE. They are to be used as per the nature of the solution to be titrated; whether or not it has a corrosive effect on glass or PTFE. While titrating, the barrel of a digital burette is held in a fixed position, and the plunger is moved incrementally in one direction manually by turning the knob. The volume gets displayed on a digital screen. An electronic burette or e-burette, like the MICROLIT E-BURETTE, is an advanced burette designed keeping ergonomics and intuitive handling in mind. It offers sophisticated features and functionality like, motor controlled piston movement, a touch screen enabled Control Panel with graphical user interface (GUI), and calibrated pre-set speeds to perform highly accurate titrations. 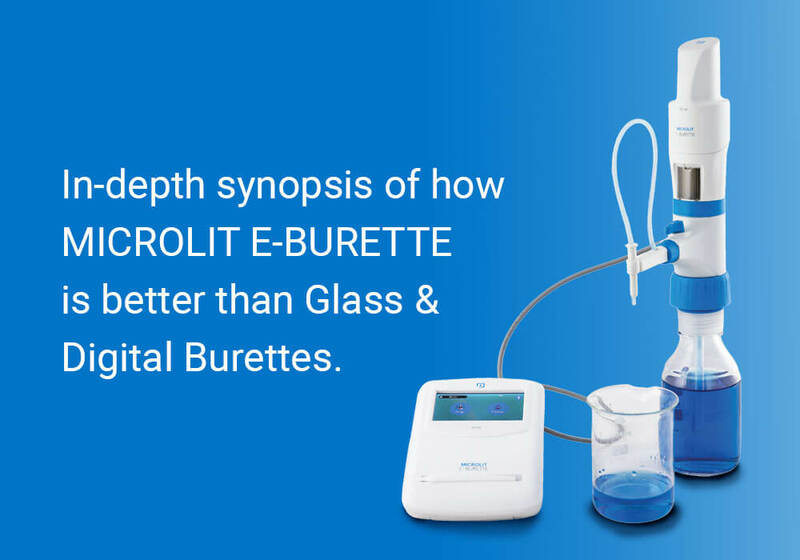 The accuracy offered by the MICROLIT E-BURETTE is way higher than that offered by glass burettes. Also, there is negligible chance of human error due to automation of most of the work unlike in the case of glass or digital burettes. Its motor controlled piston movement eliminates the limitations of digital burettes and glass burettes that dispense manually. The user-friendly touchscreen guides quick and accurate titrations and displays numeric data up to the second decimal. It also offers the user a choice to work at pre-set speeds during titrations including dropwise dispensing, which helps in achieving the endpoint with high accuracy. MICROLIT E-BURETTE comes with 3 Calibrated Pre-set Speeds, including dropwise dispensing. High Speed Dispensing: Dispenses at 1.517 ml/sec. Low Speed Dispensing: Dispenses at 0.491 ml/sec. Dropwise Dispensing: Dispenses at 0.010 ml/sec. In conventional Digital Burettes, dispensing is done ‘manually’ with the help of a rotating wheel, whose speed of rotation is not fixed and varies from user to user. Any abrupt changes in the speed may result in inaccurate and imprecise results as per ISO 8655 guidelines. The Motor Controlled Piston Movement of MICROLIT E-BURETTE, at 3 Pre-set Speeds, rules out the effort invested in manual wheel operation and hence, any inconsistencies arising due to the variations in its speed. This ensures high accuracy and precision.